Our "One and Done" classes are designed for the instant gratification of completing your entire painting in only one class. Most of our students prefer to be unencumbered by supplies and painting paraphernalia, so we provide all of the top quality materials you need to complete your painting. Just come as you are, and go home with a "masterpiece". 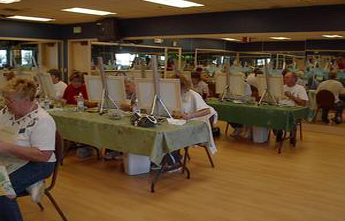 In our oil painting classes, we specialize in using the Wet-on-Wet Technique popularized by TVs most famous artist, Bob Ross. Even if you've never painted before, we will take you step by step towards creating a beautiful painting you will be proud to display on your wall, or give as a gift to family or friends. It really can be as easy as Bob makes it appear on TV! We'll show you how. With more than twenty classes each month all around the Valley of the Sun, there is sure to be a location near you. The CALENDAR/SCHEDULE listing includes class times and each month's painting project in that location. Just click on the link to get the information you want. 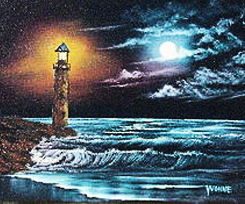 To learn where and when we will be doing each painting, click on the new CLASS FINDER link. Select the community by clicking on its name to find the address, class information and photos of projects offered. Check our Photo Galleries to find our entire portfolio of paintings and you can key into the locations and dates for each painting project on our schedule. All of the paintings in the Photo Gallery are for sale: $90 unframed and $125 framed. • Discover for yourself how oil painting can be achievable for everyone . . . even if you've never painted before! • Discover for yourself why we are the Valley's premier Painting Instructors. • Discover the artist in YOU! You'll be glad you did. Check out our new projects on our Studio Classes Page. All of our Paint Arizona series only happens in our Studio so be sure to sign up in advance for these classes. Don't be disappointed. This site is dedicated to sharing our JOY of painting with our students and would-be-students. Explore these pages to find all the information you need to launch yourself on one of the most satisfying & creative adventures of your life! Follow the links to find information on painting class projects, class schedules, and our Newsletter. Then, send us an e-mail to sign up for classes or for more information about the Wet-on-Wet Technique. Don't forget to save Xperience The Joy on your Favorites List! If you would like to receive any of our periodic mailings or updates, please click on our 'Contact' tab and complete the form.